There are 3 organic forms of vitamin B6, namely pyridoxal, pyridoxine, and pyridoxamine; each represent a different stage in the body's metabolism of B6. Pyridoxal-5'-phosphate (P5P) represents the advanced stage of this metabolism, the stage at which B6 has been converted into a coenzyme, a catalyst for at least 113 known essential enzymatic reactions in the body. Primary Uses: Studies show that for people with compromised liver function, P5P is 3 times more likely to be absorbed than conventional B6. In addition, the enzymes that convert conventional pyridoxine to P5P have found to be impaired in those with autism. Low P5P levels have been linked to an increased risk of heart disease, and B6 is known to reduce homocysteine levels, a toxic protein linked to heart disease. P5P also boosts immune cell function during illness. Secondary Uses: P5P is required for the production of serotonin and GABA, neurotransmitters that control mood, pain perception and nervousness. P5P has also been shown in animals to reduce the formation of AGEs (advanced glycation end-products), which are damaged proteins that render tissues dysfunctional. AGEs are appropriately linked to aging and dysfunctional tissues. Anyone taking regular B6 should consider switching to P-5-P for guaranteed effectiveness. 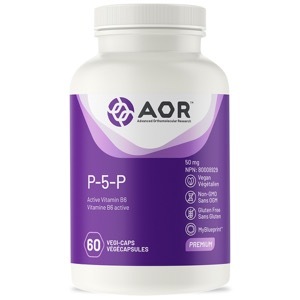 P-5-P is essential for those with liver disorders, autism or anyone diagnosed with compromised B6 metabolism. P-5-P supports immune function in those who are critically ill, and pregnant women may benefit from the anti-nausea effects of vitamin B6. Adams JB, et al. Abnormally high plasma levels of vitamin B6 in children with autism not taking supplements compared to controls not taking supplements. J Altern Complement Med. 2006 Jan-Feb;12(1):59-63. Cheng CH, et al. Vitamin B6 supplementation increases immune responses in critically ill patients. Eur J Clin Nutr. 2006 Oct;60(10):1207-13. Epub 2006 May 3. Ellis JM. Prevention of myocardial infarction by vitamin B6. Res Commun Mol Pathol Pharmacol. 1995 Aug;89(2):208-20. Labadarios D, et al. Vitamin B6 deficiency in chronic liver disease–evidence for increased degradation of pyridoxal-5&#8242;-phosphate. Gut. 1977 Jan;18(1):23-7. Parker TH, et al. Effect of acute alcohol ingestion on plasma pyridoxal 5&#8242;-phosphate. Am J Clin Nutr. 1979 Jun;32(6):1246-52. Vitamin B6 (pyridoxine and pyridoxal 5&#8242;-phosphate) – monograph. Altern Med Rev. 2001 Feb;6(1):87-92.